The 36.24 metre motor yacht Choo Choo has been listed for sale by Gregory Gheraia at BlackOrange Yachts. Designed by Alessandro Lombardi, Choo Choo was built in GRP by Italian yard New Versilcraft to RINA class with delivery in 2006 and has been used only privately since new. Comfortable accommodation is for eight guests in four cabins laid out as two doubles and two twins, all with entertainment centres, television screens and en-suite bathroom facilities. 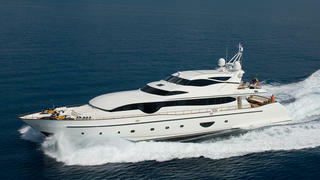 In addition, there are quarters for six crew in three cabins on this yacht for sale. The saloon, designed by Angelo Neri, has light wood panelling and off-white soft furnishings, creating a light and airy atmosphere accentuated by splashes of bright colour on the scatter cushions. Amenities include a formal dining area with seating for eight guests and an entertainment centre including a 36-inch Sony Bravia television screen and a stereo Dolby surround sound system. Between the saloon area and the galley is a cleverly conceived bar to port with three stools, creating a special nook for a drink and a casual snack. The sheltered aft deck has built-in upholstered seating, a table and chairs for al fresco entertaining and dining. Meanwhile up on the sundeck aft is a set of sun loungers and forward is a dining area sheltered from the sun by a hard top. A powerful propulsion system comprising three 1,824hp Caterpillar diesel engines gives her a cruising speed of 21 knots. Also, 30,000 litre fuel tanks allow a maximum range of 1,036 nautical miles at a comfortable 12 knots and she is fitted with those indispensable zero-speed stabilisers. Lying in Cannes, France, Choo Choo is asking €3,500,000.